Combine all ingredients to make a dough, adding the cold water 1 table spoon at time. Place dough in chiller. 반죽을 만들기위해 모든 재료를 혼합하고 찬물 1테이블스푼을 넣는다. 반죽을 냉각기에 넣는다. In a small pot, melt butter add sugar, calamansi juice and the rest of the ingredients over low heat. Stir continuously until thick. Add Cashew towards the end. 작은 냄비에 버터와 설탕, 칼라만시 주스 그리고 나머지 재료를 넣고 약불에서 녹인다. 걸쭉해질때까지 계속해서 젖는다. 마지막에 캐슈를 넣는다. Using a mixer or a whisk, beat all ingredients (except desiccated coconut) until stiff peak. 믹서기를 사용하거나 손으로 저어 모든 재료들이 뾰족뾰족 서는 것처럼 될때까지 젖는다. 1. Roll out dough, the same size as your pan (preferably removable bottom). Gently lay in the pan, cover and chill for 15 to 20 mins. Bake crust for 20 mins or until dry and lightly brown at 400 deg. 2. 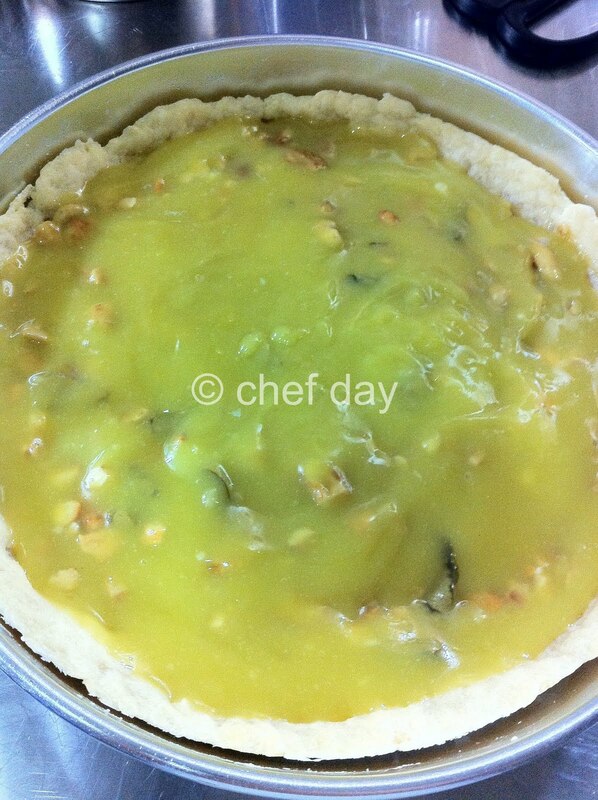 Let crust cool a little, pour the filling. 3. Using a spoon, cover the surface with dollops of meringue. Sprinkle top with desiccated coconut and return to oven for another 10 to 15 mins until meringue is lightly brown. 1. 반죽을 팬의 크기만큼 밀어 펼친다. (팬의 바닥에서 잘떨어지게 한다.) 팬에 부드럽게 올려놓고 커버를 씌우고 15분에서 20분동안 식힌다. 크러스트를 20분동안 굽거나 혹은 건조되고 엷은 갈색이 될때까지 400도에 나둔다. 2. 크러스트가 약간 식힌뒤 속을 채워 넣는다. 3. 스푼을 사용하여 머랭으로 표면을 덮는다. 위에 말린 코코넛을 뿌리고 머랭이 다시 엷은 갈생이 될때까지 10분에서 15분동안 오븐에 넣고 굽는다. 1. Calamansi is also known as Calamodin . 2. Calamnsi is not just used in cooking, but also for household and medicinal use like body deodorant! 3. I love serving and eating this chilled and with hot honey-ginger tea ! 2. 칼라만시는 요리에서 뿐만아니라 가정 그리고 체취제거제 와 같은 치료제로 쓰인다. 3. 꿀을 넣은 생강차와 함께마시면 좋다.